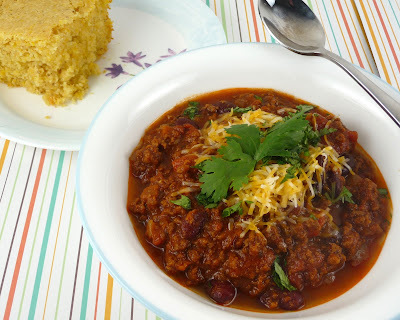 This is a very similar chili recipe to the turkey chili recipe I make. I like this version - there are no hidden ingredients or surprise flavors - it is really simple and tastes the way I think chili should taste. I serve it with my favorite cornbread (recipe coming soon). This recipe definitely takes awhile to cook - so plan accordingly. But it also freezes really well - so in some ways it becomes a simple, quick meal too! 1. Heat oil in large heavy-bottomed nonreactive Dutch oven over medium heat until shimmering but not smoking, 3 to 4 minutes. 2. Add onions, bell pepper, garlic, and spices; cook, stirring occasionally, until vegetables are softened and beginning to brown, about 10 minutes. 3. Increase heat to medium-high and add half the beef; cook, breaking up pieces with wooden spoon, until no longer pink and just beginning to brown, 3 to 4 minutes. Add remaining beef and cook, breaking up pieces with wooden spoon, until no longer pink, 3 to 4 minutes. 4. Add beans, tomatoes, tomato puree, and 1/2 teaspoon salt; bring to boil, then reduce heat to low and simmer, covered, stirring occasionally, for 1 hour. 5. Remove cover and continue to simmer 1 hour longer, stirring occasionally (if chili begins to stick to bottom of pot, stir in 1/2 cup water and continue to simmer), until beef is tender and chili is dark, rich, and slightly thickened. Adjust seasoning with additional salt. 6. Serve with lime wedges and desired condiments - diced tomatoes, cheese, cilantro, avocado, etc.